I just spent a few days visiting my sister and brother in law in NYC, so I have a couple photos and something I made for them to share... and I can also show you some baby shower gifts I made for my cousin! Busy, busy!! Another intricate design to get your, almost invisible, hook into! 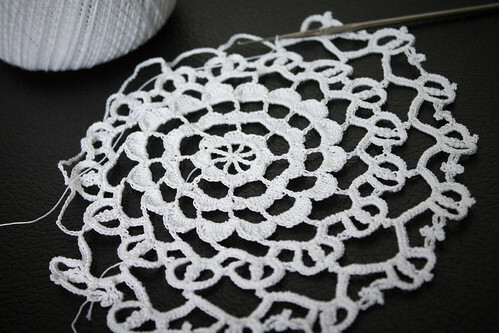 It looks as if this pattern could be from a vintage book and reminds me of doilies I used to see at my grandmother's. Your work is very dainty and intricate! These days I seem to be into giant hook crocheting, well a 6mm one anyway, and using double yarn threads! I felt clumsy at first, but love how fast the work grows! Pretty doily. Seems like I have been doing nothing lately. You are great inspiration to get creating.